Two Reflective Teachers: Slice 30 of 31-#sol17: Why do we stop asking questions? Slice 30 of 31-#sol17: Why do we stop asking questions? This is the 10th year that Two Writing Teachers has hosted the Slice of Life Challenge. Day 30 of this 31 day writing challenge! There was a time when hitting the publish button scared me. (It sometimes still does.) There was a time when public speaking scared me. (It frequently still does.) Yesterday, I realized that asking questions can be scary, too. Maybe I'm a little paranoid. Maybe I need a dose of confidence. Maybe it's good my OLW for 2017 is brave. But here's the deal. After writing yesterday's post where I developed questions around a topic, I realized that asking questions is a more vulnerable practice than I'd realized. There's the worry that you're asking a stupid question, a question that reveals your incompetency, a question to which everyone else in the room (or in the blogosphere) knows the answer. Yep, there's that. There are all those! More and more, I've been trying to incorporate inquiry into the curriculum I write, and not just an inquiry lesson where the teacher poses a question along the lines of "What are ways to hook readers in introductions?" and students work to answer it. Instead, I've tried to impress upon our learning communities the importance of students generating questions that spin into learning. Of honoring curiosity, of recognizing meaningful research ideas, of exploring questions and topics that go beyond an affirmation of what the teachers already know. 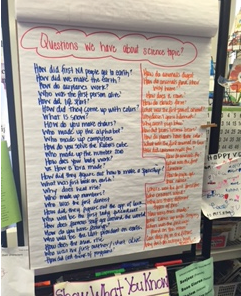 What impressed me post about this list of questions is that the second-graders had NO closed-ended questions. They loved the activity, everyone participated, and I never had to even remotely manage hurt feelings or put-downs. Let me say again that this was second grade. For a few years, this graph has haunted me. (Maybe now it will bother you, too.) 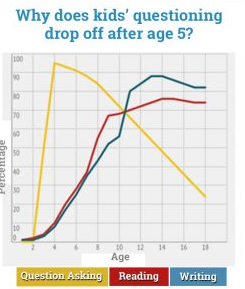 I know there could be many explanations for the drop-off in questions after the age of five, and I've thought a lot about this over the years. Maybe it's because children realize they exhaust their parents. Maybe children react to the idea that teachers ask the questions and students' jobs are to answer those questions. Maybe reading lessens the need to ask questions because children develop the ability to answer their own questions. But until yesterday, I hadn't considered the element of vulnerability. What if it has more to with the self-consciousness that develops as children approach pre-adolescence, moving into the stage of life when other people's opinions matter? What if it's more to do with the recognition that other people react to them and form judgements? I was uncomfortable putting my questions out there in yesterday's post because maybe my questions revealed my ignorance or my incompetence or my inferiority. I know people say there's no such thing as a stupid question, but as I tried to produce questions, I wasn't sure this statement is true or that people really believe it. I've learned so much about writing from being a writer. Maybe the best way to really, really learn about questioning and how to teach it is by doing more questioning and paying attention to the metacognitive work it involves, as well as the feelings of insecurity and vulnerability it evokes. And so I have discovered another reason to be brave in 2017. I completely agree with you -- we need to think more about this. Questioning does reveal a lot and I think we often judge people based on their questioning -- ignorant, how could they not know, can you believe they asked that??? It totally evokes feelings of insecurity and vulnerability. I love the graph too - I have seen it but not with the connections you are making. This is really so powerful!! Your last paragraph has me thinking deeply about getting better at using questions or asking questions. You have given me much food for thought. And I need to explore more from the More Beautiful Question website! Slice 26 0f 31-#sol17: Finally a ten! Slice 20 of 31- #sol17: Happy Birthday to Julia! Slice 15 of 31-#sol17: What do I make?